Weird, funny, and a perfect change of pace. Chris Pratt as Peter Quill / Star Lord. I’m hooked on a feeling: I’m in love with this movie! Guardians of the Galaxy is the first standalone Marvel movie we have seen in a while, and boy, does it deliver. Right from the beginning, Chris Pratt as Peter Quill, aka Star Lord, sets the funny and carefree tone that continues throughout the movie. This is a great change of pace for the Marvel movies and superhero movies in general which tend to focus on darker themes and varying levels of brooding. Guardians of the Galaxy had some of the best examples of excellent previews that actually portray the feel of the movie without giving away the story. The whole movie is action-packed and space adventure-filled, with a balanced amount of fun and excitement that hasn’t been seen since the original Star Wars trilogy. For a relatively unknown comic series to more general audiences, this movie does an excellent job at getting the audience invested in the each of the characters; even a talking raccoon and a walking talking tree. This movie marks a turning point in the Marvel cinematic universe both in tone and the overall story that intertwines the movies. This is the first one in the franchise to not take itself seriously as a movie and it just has fun. Rocket Raccoon, voiced by Bradley Cooper, is the best example of this. Throughout the movie, Rocket’s dry humor and obsession with guns and explosives is even funnier with the irony that he is one of the most practical characters in the movie which is made very apparent in several “dramatic” sequences. As for Groot, voiced by Vin Diesel, he may be the most beloved character in the movie. He may only say “I am Groot” a thousand times throughout, but his level of friendliness and innocence, paired with his powerful strength and abilities in combat, makes him my favorite in the movie. Looking ahead for the MCU, we got to see the first full look at Thanos, voiced by Josh Brolin, whom we discover is after the orb which holds the purple Infinity Stone. 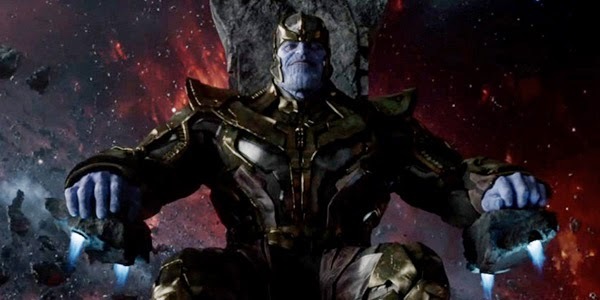 While Thanos does not have a large role in the movie nor in the MCU right now, he is sure to become more and more involved as Marvel moves into Phase 3. The true antagonist for the movie is a Kree alien called Ronan, played by Lee Pace, whom many will recall played the Elven King Thranduil in The Hobbit: The Desolation of Smaug and will reprise the role in The Battle of Five Armies. First full look at Thanos. Easter eggs run rampant throughout the movie, particularly in the scenes with the Collector played by Benicio Del Toro, including a Dark Elf from Thor 2, a Chitauri soldier from Avengers, and Cosmo the Space Dog to name a few. And of course, Stan Lee makes a wonderful appearance as usual. Although Guardians of the Galaxy is not yet tied directly to the other movies in the MCU, it is great to see all these indirect ties which secures the excellent level of continuity the MCU has been able to maintain. Josh Brolin is showing off his Inifinity Gauntlet at the Marvel Cinematic Universe panel. Last week at San Diego Comic Con International, the Marvel panel only announced the title of one out of the eight untitled movie release dates which happened to be Guardians of the Galaxy 2. Though it is unfortunate that they did not announce more, it is exciting to see this level of confidence as they branch out from the previously established characters. The movie does not have any sneak peeks at upcoming films, but it does succeed at raising anticipation and expectations for the coming installments. As for that post-credit scene… without spoiling anything, I’ll say the general audience will probably not understand it. However, the director, James Gunn, has recently posted to Twitter that it was simply a joke. In any case, I found it hilarious. 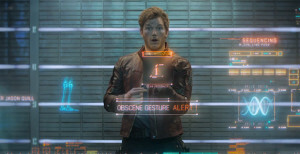 Opening Thursday at $11.2 million, GotG is the biggest Thursday night result of the year. This is a must see for all the MCU fans and for everyone who loves action, adventure comedies IN SPACE.